Sean Yongjoo Lim is a 16 years old violinist. Lim is currently studying at the Cleveland Institute of Music Young Artist Program under the tutelage of Jaime Laredo and Jan Mark Sloman. Performing in large venues such as Carnegie Hall, Lincoln Center, John F. Kennedy Center, Strathmore, and Smithsonian National Gallery of Art, Lim’s first solo debut performance with orchestra was with the Kostrama Symphony Orchestra conducted by Pavel Gershtein in Russia at the age of 12. Lim has been featured as a soloist with the U.S. Army Orchestra, the Howard County Concert Orchestra, the Landon Symphonette, the Strathmore Gala Event, and the Maryland Classic Youth Philharmonic Orchestra. In January 2015, Lim also successfully performed full-length solo recital, featured by the National Symphony Orchestra Youth Fellowship Program, at the John.F. Kennedy Center Millennium Stage. Lim has received numerous 1st place awards from the regional and international competitions including The WPAS Feder Memorial String Competition, the Army Orchestra Young Artist Competition, the FMMC High School Competition for Strings in memory of Gustave N. Johansen, Jr., and the James C. Macdonald Fine Arts Scholarship Competition. Lim competed in the 2015 International Boris Goldstein Violin Competition as one of its youngest participant. Lim was also named twice as an honorable winner of the National YoungArts Foundation in the years 2014 and 2015. This year, Lim was chosen as a winner of Ohio MTNA Competition and honorable winner of American String Teachers Association 2016 Solo Competition for age 16 to 23. 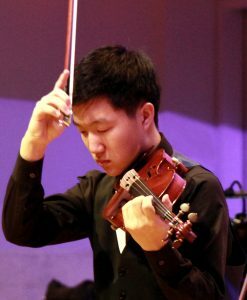 Lim served as a National Symphony Orchestra (NSO) Youth Fellow and Co- Concertmaster of the Maryland Classic Youth Orchestra (MCYO) Philharmonic and American Philharmonic Concert Orchestra. Learn more about Sean Yongjoo Lim at seanlimviolin.com.